This fall, as the weather drops, we’re all reaching for our favorite flannel and getting ready to hibernate in front of our TV screens. However, don’t get too comfortable! Fall can be the best time of year for great fashion, and 2018 is all about shimmery fabrics and bright colors. This season put your best foot forward and enjoy the outdoors as you show off your 2018 fall look. A fashionable fall style doesn’t have to be complicated. Don’t hide your flannel just yet, because plaid is in this year. Try wearing brighter plaids, such as yellows and oranges, for a bold statement. Even out the look with some subtle but gorgeous Kendra Scott earrings. Panache Apparel & Accessories sells studs with a wide variety of colored stones to match any outfit you put together. Try pairing a yellow-based plaid shirt with some deep purple earrings, plus a matching necklace from Kendra Scott. The delicacy of your jewelry will provide the perfect contrast to the casual tone of the plaid. Add some cute heeled boots to really bring the look together. Finally, this fall we are all about shimmer. Metallic clothing is hugely popular and creates quite the fashion statement. It’s important to avoid too much silver or gold in your jewelry if you’re wearing a metallic dress, but there are ways to incorporate some classy accessories into your look. You can find Kendra Scott necklaces with thin chains but colorful pendants at Panache Apparel & Accessories, or colorful rings from Ronaldo Jewelry which will balance the shimmer of a metallic outfit and have you ready to be outside enjoying the fall weather and looking like a fashion queen. Stop by Panache to look through our clothes and jewelry and begin your 2018 fashion haul for the best, and brightest, season. 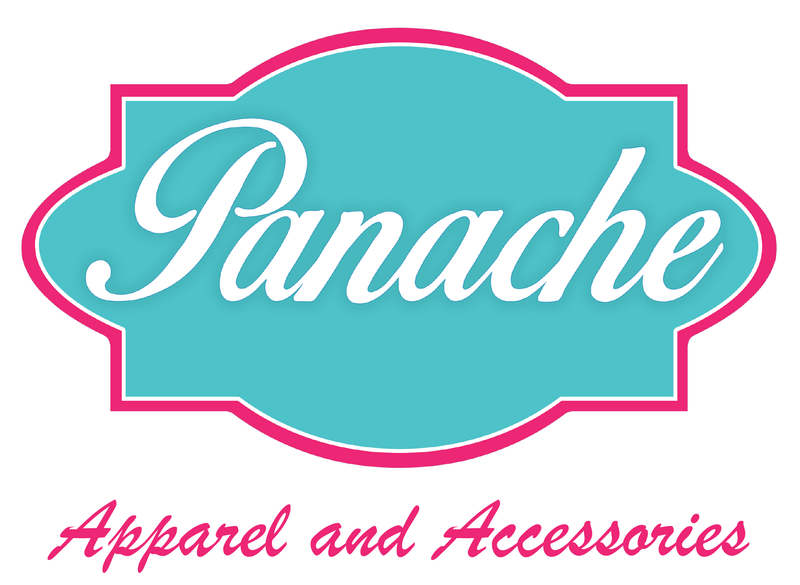 When it comes to fashion boutique Gulfport MS, Panache is where you need to be. Panache is your source for all the most current trends. Whether you’re in the market for a stylish cold-shoulder top or a new necklace, we have just what you need to complete your look. At Panache, we also pride ourselves on having the best selection of accessories. Whether you’re in the market for a dangly earring, a scented candle or a new scarf, we’ve got what you need. Don’t keep wondering, “is there a good fashion boutique near me?” We pride ourselves on being the best-stocked fashion boutique Gulfport MS. We sell beautiful earrings by Kendra Scott, bracelets by Gemelli and Ronaldo, cocktail rings and several beauty accessories. Our goal at Panache is to help every woman show her best self to the world. Some of us are divas and some of us are demure. At Panache, we have sweater sets and simple initial necklaces. But we also have big cocktail rings and bright colors in stock. Here, you’ll find things that can help you feel more confident in your own skin. Our accessories will give you that extra hint of sparkle. That can be a very powerful thing, a great finishing touch. Accessories can also be very emotional gifts from the ones you love. Who doesn’t have a piece that was given to them for a milestone? Most famously, there’s the engagement ring. But the birth of a child, a milestone anniversary or a big birthday can also be a time for a gift that endures. Gold or crystals aren’t just valuable because they sparkle. They’re also things that endure, and can be passed down from mother to daughter. Panache is proud to carry accessories that stand the test of time. Panache is not only about jewelry, of course. We carry some of the chic-est sunglasses on the market today. This season, embellishments on the wings of sunglasses are very in. Whether it’s a stylized logo or delicate latticework in metal, we have just the pair you need to really make a statement. Classic plastic frames that recall Old Hollywood are also very on-trend at the moment. Finally, some of our favorite accessories at Panache are self-care beauty items. We carry great sleep masks, for example. They can be cooled off in the fridge or warmed up in the microwave. They’re packed with all-natural flax seeds, not strange chemical gels. And we know from experience that they provide real relief, whether you’re dealing with a long day at work or a migraine. Stop wondering, “Is there a fashion boutique near me?” Honey, we’re the best in town when it comes to Gulfport. Come on down and take a look. We’ve got every accessory you need, from women’s clothing, to jewelry and scented candles. We’d love to meet you and help you find just what you’re looking for. Mules are an incredibly hot style for summer 2018. They allow the wearer to simply slip into the shoe and go about their business. Toe ring sandals have also been a popular trend for the year. These shoes have a small piece of fabric or leather wrap the big toe and act like a flip flop with an extra touch of flair. Color pop shoes are also all the rage in the summer. Just choose a shoe that is a bright and vibrant color and pair it with either basic or vibrant colors that you’re wearing in your outfit. The most popular material for summertime shoes remains to be leather. Leather is long-wearing and is cool when put into a style that allows for a lot of air flow to the foot. Some other popular materials in summer footwear include nylon, polyester and suede. There’s also nothing quite as popular during the summertime as a cork heal or foam sole. Because the summer allows us all to experiment with looks and choose shoes that we can enjoy pairing with a variety of different cool outfits, the sky is the limit when choosing a style that works for you. Don’t be afraid to buy a bright-colored shoe that you normally wouldn’t wear and try to avoid shoes that are restrictive or closed, as this not only looks heavy but is going to cause you to feel hot and bothered in the warm summer sun. Choose quality footwear from Panache Apparel and Accessories to complete your look and fall in love with summer. When you feel confident in what you’re wearing, you feel better about the way that you look and will walk with more gusto. Quality shoes will last you all season long without the need for replacement or repair, and the price is well worth what you get when you have shoes that you can count on throughout the summer. Fashion is a means of expressing yourself. You can allow your inner beauty to shine through your outer beauty through your palatable choices in apparel and accessories. Fashion is also a staple of the times. One of the ways that a time period is remembered is through its fashion trends. Following fashion trends makes conformity not so daunting. Polka dots are no longer restricted to circus clowns. This spring, polka dots will be omnipresent on apparel and accessories, most prominently on dresses and handbags. Black and white polka dots will be the most popular color combination of this popular spring design. Carnation pink, orchid, baby blue, mauve, and many more pastels will go beyond the cute Easter dresses this spring. Pastel colors provide a soft, yet classy look to all spring fashion. Since you will be spending more time in the sunlight, wearing lighter colors will help you not feel as hot, allowing you to spend even more time outside. Symmetry is not always so cool. This spring, asymmetry will be dominating shirts and dresses. Asymmetrical style adds versatility to any look. The most common asymmetrical style is a long sleeve on one side and no sleeve on the other side, making the outfits look like a hybrid between winter and summer clothing. Catherine Popesco knows that crystals are fit for a queen, so she designed her new bracelets and stud earrings for La Vie Parisienne with chunky crystals. Vivid blue ruby, tangerine, teal, and vintage pink allow these chunky crystal bracelets and earrings to make every person shine with their own light in both the spring and summer. These bracelets look even more stunning when layered with other bangles or with each other. Champagne-colored jewelry is perfect for anyone who is aiming for a true vintage look. A variety of Catherine Popesco’s pendant necklaces and earrings are available in champagne colors. These necklaces and earrings also contain chunky crystals, allowing every wearer to look like a vintage queen or add neutrality to a glamorous look. Kendra Scott is making jewels the real-deal this season by making her jewelry frameless. Her frameless and free jewelry allows for the glimmering jewels to be the focal point of the pieces. The spring and summer sun will have an easier time making the jewels glimmer this season. In addition to being a color that goes along with the pastel clothing trend, lilac is also appearing on many of Kendra Scott’s designs. Lilac provides the jewelry with a youthful, feminine look that goes along with the freshness and renewal of spring. The lilac jewelry will match perfectly with your lilac clothing and coordinate well with your clothing of other pastel colors. Graduation hats will not be the only accessory where tassels will be seen, and teenagers will not be the only demographic wearing fringe. Tassels and fringe will be adding an edge to this season’s jewelry. Let’s face it. It’s never too early to spruce up your jewelry collection for the upcoming seasons. With the sun shining bright and patio weather in full bloom, we’ve got you covered with these Kendra Scott jewelry trends. If there’s one thing we’re sure of, statement pieces are not going out of fashion anytime soon. They compliment any daytime or nighttime look seamlessly and are a fun way to showcase your personality and style. For a breezy daytime look, try pairing your cute spring and summer dresses in Kendra Scott’s modern disc-shaped statement earrings in gold. For a glitzy and dramatic nighttime look, opt for a more modern oval style with gold accents in Kendra Scott’s navy Aragon statement earrings that will make any of your little black dresses pop. Rounding out our Kendra Scott jewelry trends for the spring and summer seasons are pendants. They were a hit on the runways and they’re sure to be a hit when you’re out and about. We can’t stop gushing over Kendra Scott’s frameless Abalone shell pendant necklace. It transitions extremely well from a day to night look. If you’re feeling more playful, Kendra Scott’s navy dusted glass, oval-shaped stone pendant necklace is an absolute must because of its accented gold tassel. All these styles and more are available at Panache Apparel & Accessories, one of the leading online women’s boutique to find Kendra Scott in Gulfport, Mississippi. Shop Panache Apparel & Accessories to get you ready for these spring and summer trends, and shop the best of Kendra Scott in Gulfport for fresh and innovative designs. There is no doubt to the fact that denim is one of the most evergreen fashion wear which never goes out of the trend. From jeans to skirts and from blouses to button-down shirts, denim is all about comfort, style, and smartness. The only kind of clothes which go with all seasons is denim. In the scorching summers, you can choose to wear denim bikinis or cool crop tops to beat the heat with fashion being on point. Last year had been an amazing year for denim lovers with cropped flares and old wardrobe inspired straight leg jeans, the year had followed the greatest denim trends. Gone are the days when denim were just plain bottoms that had to be worn with a plain white tee. Denim is much more about a clothing category now. Here are few of the designs which you will definitely fail to resist on! The year 2018 will witness multiple waistbands on the jeans to be pulled off with crop tops. Brands are making the waistline more prominent by marking ranges with dual waist stitching. This fashion seems good for the flabby bellies though. Rolling up the jeans hems is one of the most favorite custom fashion of all of us. But 2018 is going to be more about the flat cuffs to trend. With a larger part of the hem being cuffed or an extra applique, preferably of another shade added to hem is what you will love to wear this year. From bright yellow to rose pink, 2018 will be all about colors in the jeans. We have witnessed pink, purple and almost all shades of red on the runway in fashion weeks so now is the time to fill up your wardrobe with the jeans of your favorite color. When the spring season rolls around, it’s the perfect time to infuse new life into your wardrobe and jewelry collection. What better way to get this done than by updating your look with what’s trending for Spring 2018 in fashion jewelry and clothing? Panache Apparel & Accessories has all the latest looks to try this spring, too. Check out these three fashion-forward spring trends worth trying to update your look. Art-inspired looks have hit the runway for Spring 2018 featuring almost any type of art reference from surrealism to abstract art to cartoons. These pieces add life to any wardrobe, and it’s easy to find clothes and fashion jewelry with art-inspired looks this season. Go for an artsy vibe with a patterned Jade top, and try pairing it with white jeans for the spring. You can also bring in some bling when you pair this outfit with sparkly stackable Gemelli jewelry. Sorbet-colored palettes are in for Spring 2018. You’ll find these colors anywhere, from jewelry to fashion tops. Embrace the resurgence of this spring fashion trend by adding a pop of pink or pastel to your look. Silver metals and pastel colors by Kendra Scott are making a huge statement this Spring. From near-shoulder-sweeping tassel earrings to glitzy chandelier earrings, statement earrings are a staple for Spring 2018. If you’re looking to make a dramatic entrance, pick up a pair of tassel earrings from Kendra Scott. Or, try a pair of LoveAO statement earrings with a sorbet-colored top to add a little bling to the pastel palettes that are popular this spring. Spring is the best time to refresh your wardrobe and jewelry collection. Panache Apparel & Accessories carries a wide selection of the latest and greatest fashion jewelry and clothes from popular brands, including Kendra Scott and Catherine Popesco. The next time you’re in the Gulfport, Mississippi, area, stop by Panache Apparel & Accessories to experience the best in fashion clothes and jewelry each season.